The death of former Yugoslav President Slobodan Milosevic dominates the Balkan region's papers on Sunday, but reaction differs sharply between Serbia-Montenegro and its neighbours. The tone in the more populist sections of the Serbian press is one of outrage, with speculation that his death, if not attributable directly to The Hague tribunal, has at least tarnished its reputation. Among Serbia's neighbours, there is a feeling that justice for the former Serbian strongman has been stolen from them. The top-selling Serbian tabloid Kurir, is unequivocal: "Murdered" is its stark caption in big letters over a front-page picture of Mr Milosevic. Glas Javnosti and the tabloid Press both run the same headline: "The Hague kills Milosevic." Both papers reflect a groundswell of feeling in Serbia that the death of the war crimes indictee in custody in The Hague was suspicious. Another popular daily, Vecernje Novosti, quotes Mr Milosevic's wife Mirjana as saying "The Hague Tribunal killed my husband". The paper goes on to report that Mr Milosevic's brother Borislav told reporters that officials at The Hague would not allow him to get medical treatment in Russia, for fear that he might evade the legal process. The Belgrade daily Politika says the fact that Mr Milosevic died before the conclusion of his trial on charges of war crimes and genocide means that he can "never be pronounced guilty". The paper goes on to say that his death reflects badly on The Hague tribunal. It comments that the refusal to grant him outside medical attention means that his death will "lie on the conscience" of the tribunal. Among Serbia's neighbours, coverage of the news takes a different tone. "The Butcher of the Balkans has died", is the headline in the largest-circulation Bosnia-Herzegovina daily Dvevni Avaz. The paper goes on to report Stephen Kay, the lawyer appointed by the court for Mr Milosevic, as ruling out the possibility of suicide because, he said, the defendant wanted to see the trial through to the end. Mr Milosevic's death is also the top story in the other Bosnian dailies, where a commentary in the Sarajevo Oslobodenje describes him as a "banker, politician, president and criminal". In neighbouring Croatia, several papers also pick up the 'Butcher of the Balkans' epithet, with Novi List speaking of his victims' "regret" that he did not live to see "a just sentence". Jutarnji List reports UN war crimes prosecutor Carla del Ponte's rebuttal of allegations that the tribunal refused Mr Milosevic adequate medical treatment. 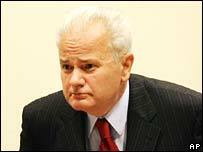 Vecernji List quotes a comment that while Mr Milosevic escaped punishment under the law, he could not escape "God's truth". Along with several other Croatian papers, it carries several pages charting the life of Mr Milosevic and accounts of the conflicts which ravaged the region while he was in power.